Astronaut Anne McClain during a 2015 training. As you've probably heard by now, Anne McClain, a Spokane native and astronaut on the International Space Station, will not be participating in Friday's spacewalk, which would have been the first with an all-woman team. It's all because of an oversize spacesuit. "Make another suit," wrote Hillary Clinton amidst the Twitter uproar. 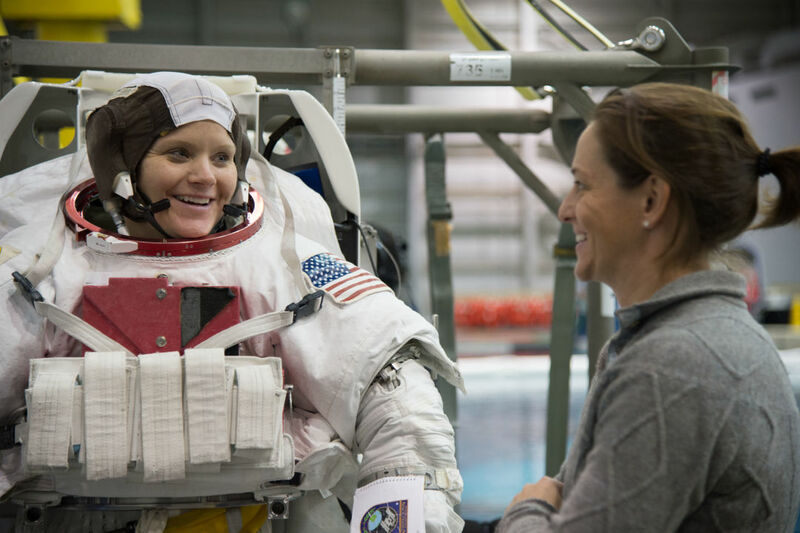 "We do our best to anticipate the spacesuit sizes that each astronaut will need, based on the spacesuit size they wore in training," says Stephanie Schierholz, a NASA spokesperson. McClain, who has lived on the orbiting research station since December, had trained in both medium and large spacesuits. But as you might imagine, things fit a little differently in zero gravity, and on a test walk last week she discovered that the medium suited her better. The station has a second medium, but it's a backup and using it would require reconfiguring the suit and exposing the life support system's interface. Spacesuits are 14-layer affairs, including a rigid fiberglass torso piece that astronauts need to dive into "with a squirming motion," according to NASA literature. That rigid piece holds onto the suit's life support system, among other things, and a bad fit can be dangerous. Astronauts regularly describe spacewalks as the most physically difficult part of their jobs (anyone seen Gravity?). "The teams made the decision to keep the schedule by swapping spacewalkers rather than reconfiguring a spacesuit," says Schierholz. "An all-female spacewalk is inevitable," Schierholz continues. "It just won't be Friday." Up until now, almost 90 percent of spacefarers have been men, while about half of the last two classes of NASA astronauts are women. Currently, the station is stocked with four ready-to-roll spacesuits: one medium, two large, and one extra-large. NASA doesn't make smalls. "All of our astronauts train for spacewalks wearing these spacesuits on a regular basis, so they are all able to fit in the existing sizes," says Brandi Dean, another NASA spokesperson. But they don't build those suits anymore, Dean says. "Instead, we are focusing our resources on the next generation of spacesuits." Those suits, she says, will accommodate a bigger range of sizes to fit a changing NASA.